The mountains are always calling me, it seems. I’ve said it before: as much as I love the ocean and spending time on a beach, it’s being in the mountains that truly makes me well up inside with all of the warm and fuzzies. 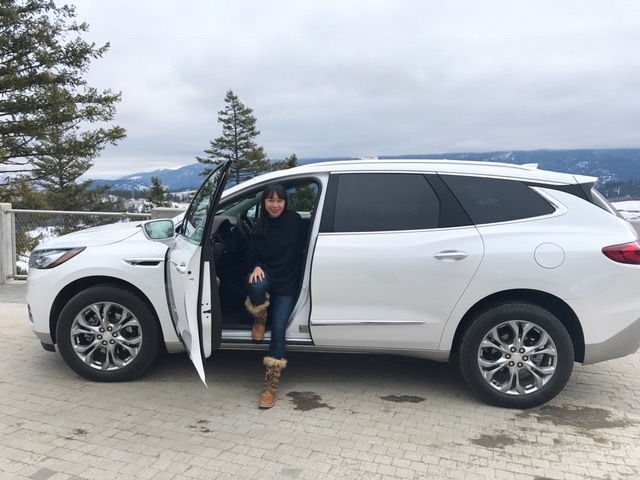 So I jumped at the opportunity to travel to Vernon, B.C., with Buick Enclave to learn about this luxury crossover SUV and to breathe in that fresh mountain air. 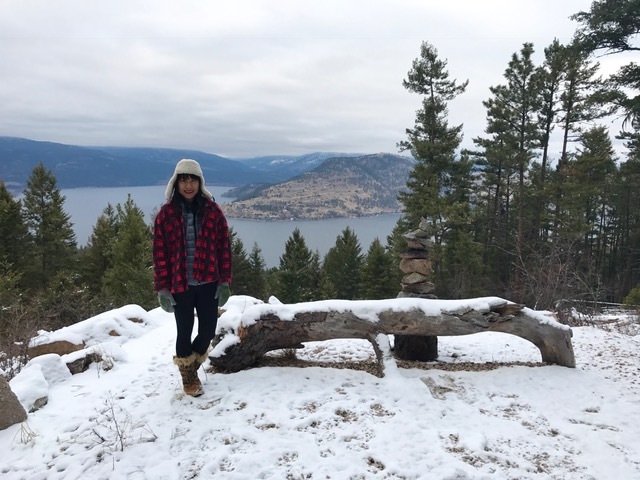 It was a whirlwind trip, but I was a busy little bunny and have 5 things you must do if you’re looking to do your own wellness retreat in beautiful Vernon. 1. Stay at Sparkling Hill Resort. The view from the floor to ceiling windows in the suites is reason enough to book a stay at Sparkling Hill. Just taking in that view and I feel more relaxed and calm. I could just go from that bathtub to the bed and back all day long soaking it up. Add in a very comfortable bed, some incredible food (everything I had from the veggie wrap at lunch to the chicken at dinner was delectable), and stress just melts away. The property is on a granite bluff overlooking Lake Okanagan and is the brainchild of the patriarch of the Swarovski crystal family, so throughout the property you’ll find more than 3.5 million Swarovski crystals making the resort shine bright. 2. Snowshoe at Sovereign Lake Nordic Centre. 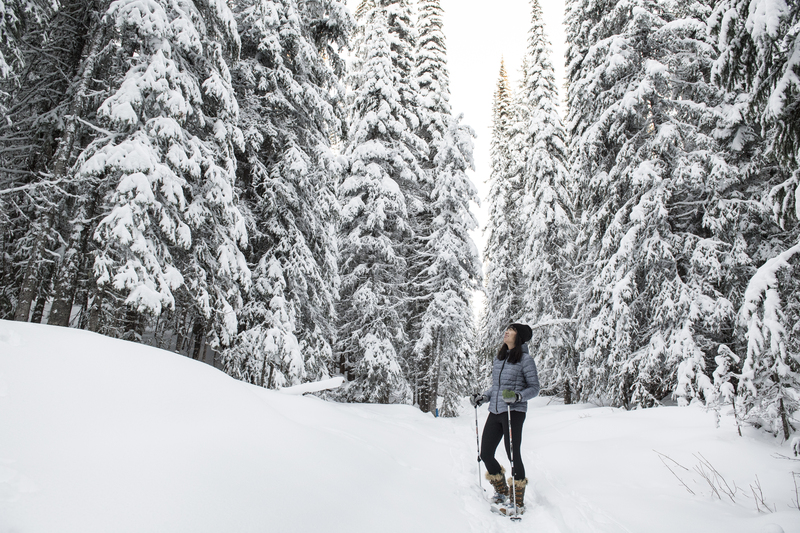 With tall evergreens weighed down with fluffy white snow, snowshoeing here with a guide is a magical winter wonderland experience. As a city girl jaded by the frigid long waits for public transit and dealing with the grey, slushy mess of downtown Toronto, escaping to a place like Sovereign Lake where winter is stunning and gives you a reason to celebrate snow is always a good reminder to make time to appreciate this most Canadian of seasons. Breathing in that fresh pine scent as you work your way through the trails is a great workout; you can burn about 500 calories an hour (but it really depends on how difficult your terrain is and how intensely you trek). 3. Go hiking. 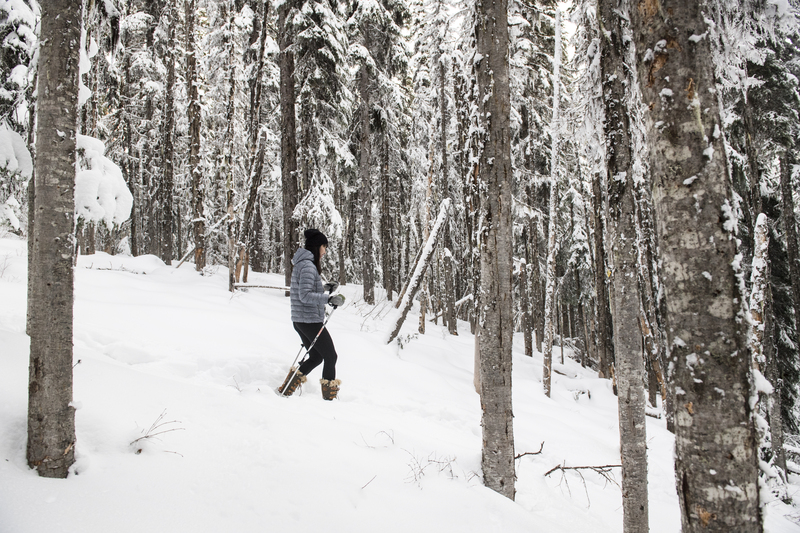 There are 25 kilometres of marked trails in and around the Sparkling Hill Resort property for hiking. It’s so quiet that it’ll just be the crunch of the snow beneath your feet to accompany you, with views of the lake and some 300 species of birds in the area to spot. The resort also offers daily guided hikes if you’re not keen about venturing out on your own. 4. Spend a day in Kurspa. Yes, an entire day. Or break up your time at the 40,000 square-foot spa over several days. 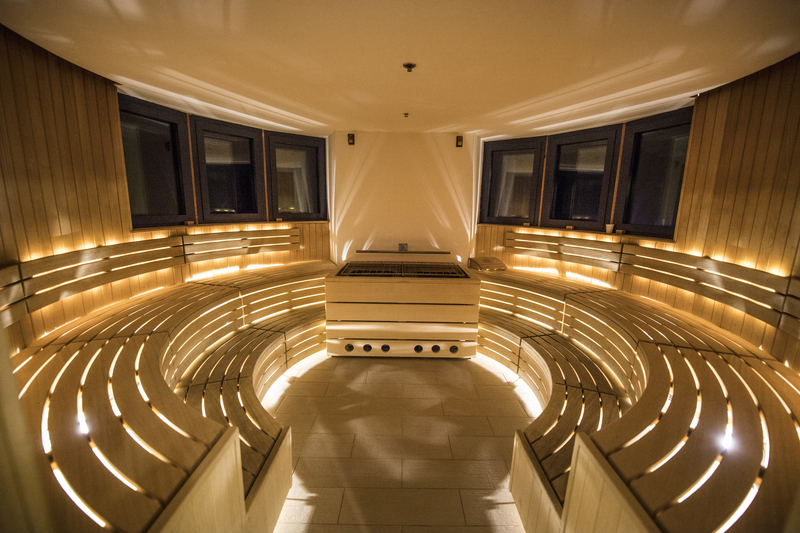 There are seven different themed steams and saunas to indulge in including Rose Steam, Igloo, Crystal Steam and Aqua Meditation. You could (and should) also walk the Kneipp Hydrotherapy, a water-stepping path through warm and cold water (it’s only about knee deep) designed to help with circulation, low blood pressure, insomnia and swollen feet. If hot pools are your jam, the one at Kurspa is designed so that you should move your way around it counterclockwise so that the specially designed jets help to soothe your body. For those who like to swim laps, you will not want to miss the indoor saltwater pool here as music is piped in underwater. And I haven’t even gotten to the spa treatments yet: try the signature Mud & Muscle if you’ve gone hard with your workouts, or the Crystal Scrub to get glowing. I didn’t have time to have a treatment since I chose to spend as much time outdoors in the mountains, but I heard the treatments are top notch. 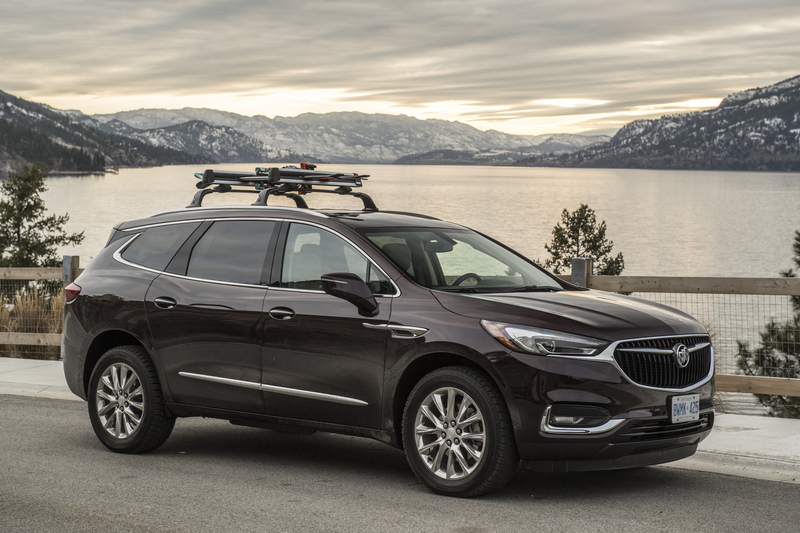 But my two top reasons a Buick Enclave is the perfect ride for this trip to a mountain escape to Vernon? Firstly, the OnStar 4G LTE wifi, which came in handy given we were in areas where my smartphone had no data connection. Up to seven devices can connect so every passenger can stream or catch up on social media and emails easily. Secondly, the QuietTuning feature. 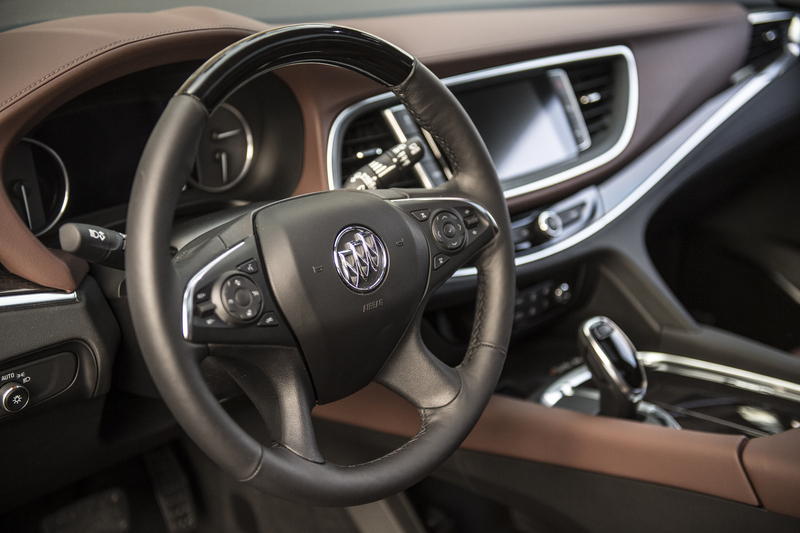 I’ve only just learned about it but it helps create a healthier and more relaxing space in your Buick. What is it? It’s an air ionizer that helps to eliminate odours and improve air quality by creating negatively charged particles that attract all of the things you don’t want in your car (the bad smells and contaminants– think dust, pollen, bacteria) making them heavy and then sweeping them out of the air in the car. 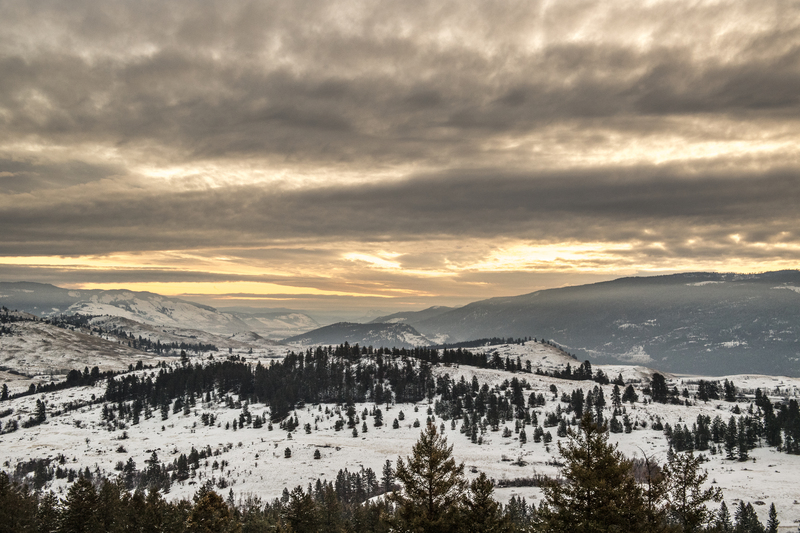 Making it that much easier for you to breathe in that fresh Okanagan air. I hope I can fit in another mountain escape into my schedule soon because they are calling again. Thank you, Buick, for this little escape to the west coast. 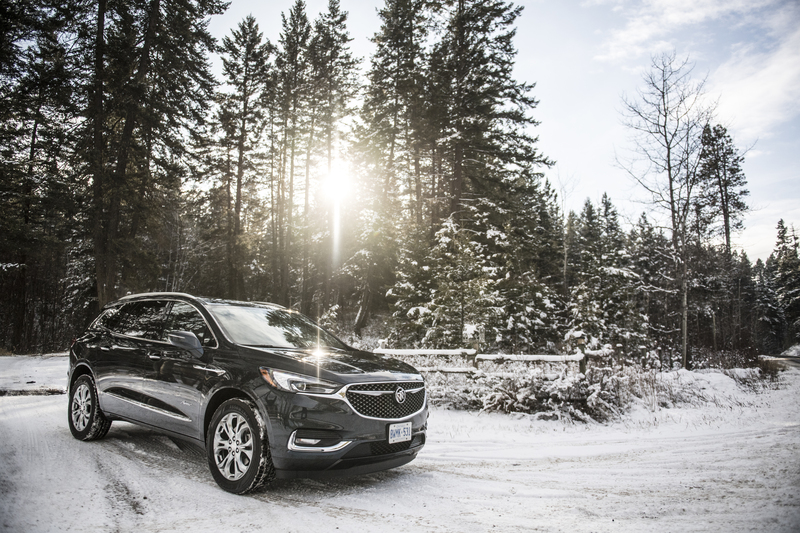 Photography (Buick Enclave in Ebony Twilight, Buick Enclave in Havana Metallic , snowshoeing, sauna, mountain view): Lucas Scarfone. 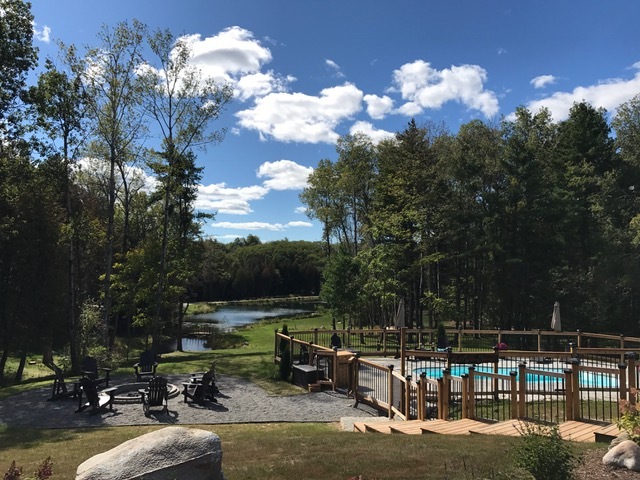 My summer of road tripping came to a close at a lovely new property that’s only about two hours from Toronto: Whispering Springs. Whispering Springs is in Northumberland County near the towns of Grafton and Brighton. It’s located nor far from the Big Apple on the 401, where I somehow have yet to visit even though I’ve driven by it many, many times. 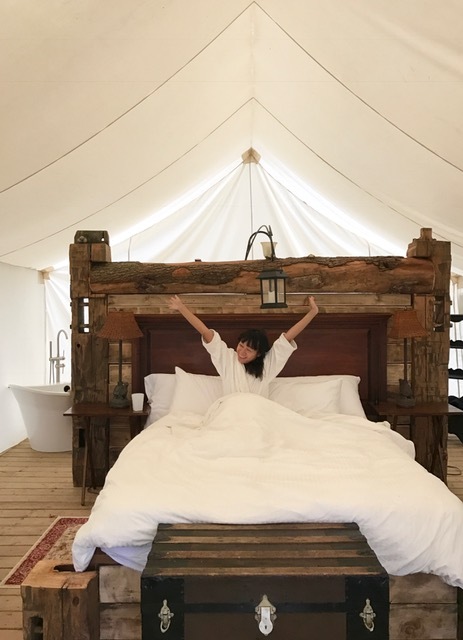 With four glamping tents and more being added for 2018, Whispering Springs is exactly the kind of getaway to nature that does the body good. It’s close enough to Toronto for a quick escape and yet the accommodations are luxurious so it won’t make city slickers feel put out. For example, you make your own fire and cook your own food on a BBQ, but there’s a fridge for your groceries in your tent (no need to pack a cooler) and firewood is supplied. Plus, you can even purchase a basket of market ingredients from Whispering Springs if you prefer to lie in the hammock rather than go pick up your own supplies. There is a farmers market nearby, however it sadly wasn’t open while we were at Whispering Springs as we visited during the week so we shopped for our groceries at the supermarket in Brighton. If you’d rather not cook at all, there are restaurants in the nearby towns. We went out for lunch one day and picked up some great fish and chips at Zack’s Diner followed by Kawartha Dairy ice cream cones for dessert at Mrs. B’s Country Candy. I got my last fix of Moose Tracks for summer seventeen! 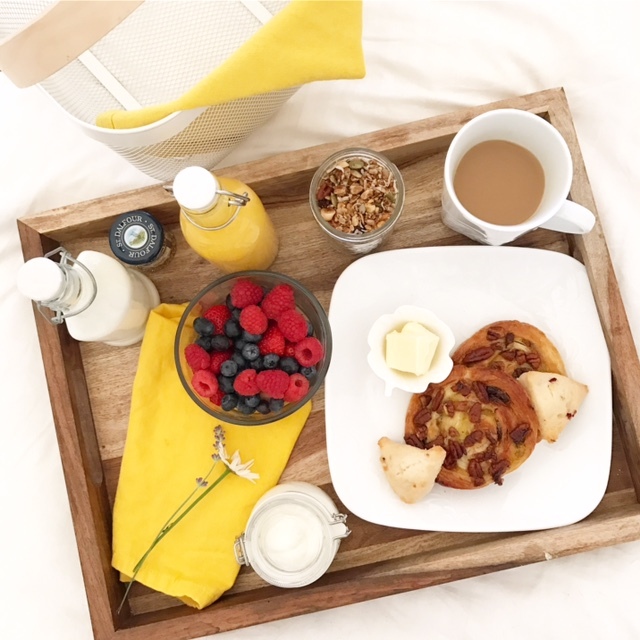 You won’t need to worry about breakfast at Whispering Springs, though, as a lovely basket will be dropped off at your glamping tent each morning. Homemade granola with yogurt, fresh baked pastries, fruit bowls; exactly what I was craving each day as I woke up to the sound of the trees rustling in the morning breeze. It’s blissful quiet at Whispering Springs and we spent most of our time just enjoying a breather from our hectic schedule. 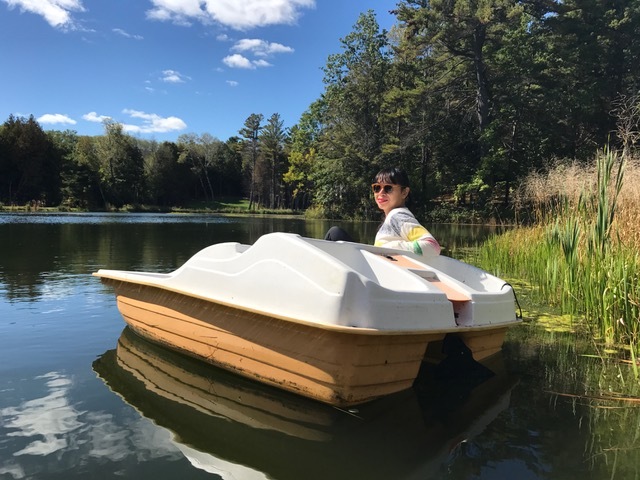 We took a whirl, well, as much as one can whirl, in the paddle boat. Enjoyed some quality hammock time. Lounged in the hot tub. 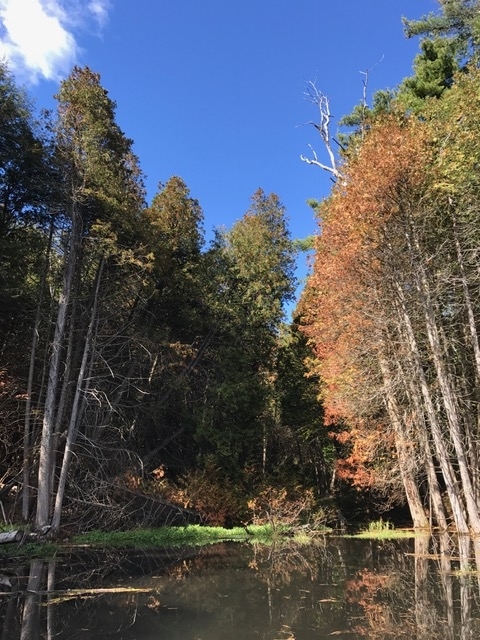 And, my favourite, we hiked two of the trails. One leads you by the lovely wedding chapel in the woods and follows one lovely little spring. 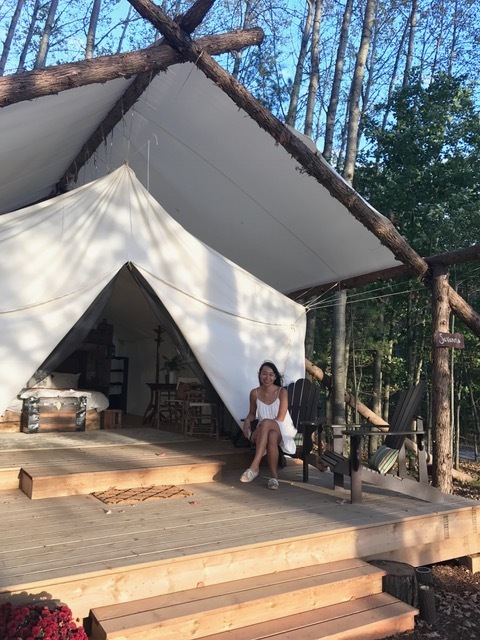 There are also yoga classes and massage therapy available at this glamping property but we didn’t have a chance to try either this trip; instead carved out our own quiet time by the pond. The glamping tents each feature a different theme. The comfortable king-size bed will make it hard to get your day going. There’s a very inviting freestanding bathtub as well; if you prefer a shower, there is an outdoor shower by the lounge area which I couldn’t pass up (showering in the fresh air is such a novelty, isn’t it?). Whispering Springs had only been open a couple of weeks when I visited (and is now closed for the season until spring 2018) but there is much more to come. 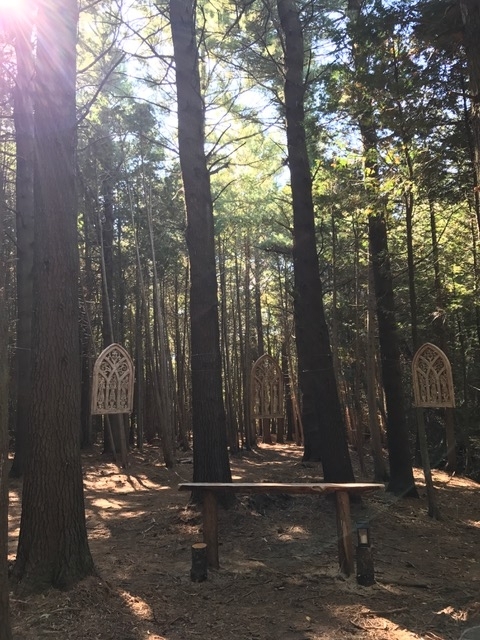 More tents will be added, and even during our short visit, we saw so much progress: the wedding chapel was coming together, and meditation stations were added along one of the trails. I can’t wait to see this gem of a destination develop even more in the years to come. If you’re thinking ahead to 2018 getaways, book now to make sure you get the nights you want at Whispering Springs; or if you’re looking for a great gift idea, Whispering Springs also has gift cards for sale (tuck one into someone’s stocking as an extra special gift this holiday season!). 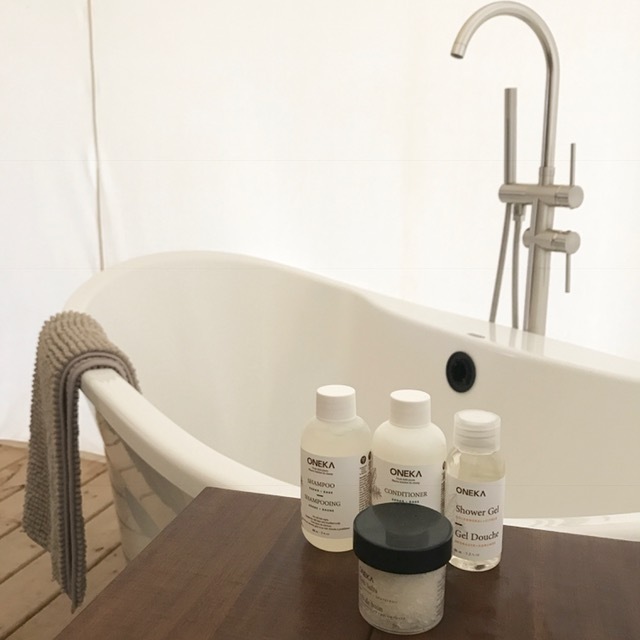 Is glamping something you’re planning on for 2018? I’d love to hear from you!